“I grew up in Candomblé houses” Silvana Magda says, when asked about her youth in Salvador da Bahia. Candomblé is an Afro-Brazilian religion, grounded in reverence for deities collectively known as orixás. It is a syncretic faith; over the centuries the orixás became associated with attributes of Roman Catholic saints. The ritual rhythms of the devout have played an enormous role in the evolution of music and culture throughout Brazil. 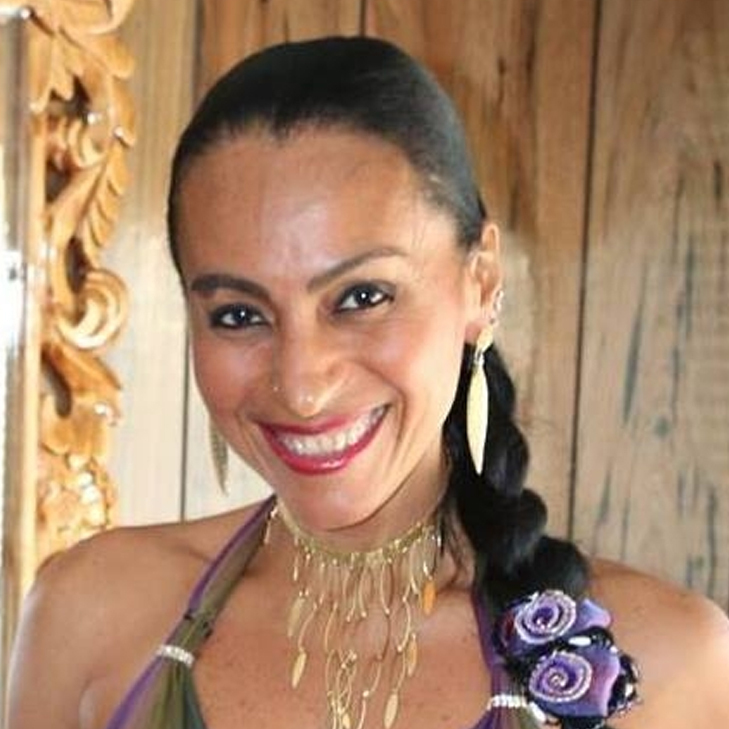 An accomplished dancer, vocalist, and choreographer, Ms. Magda admires the famous samba parades of Rio de Janeiro. The annual extravaganza, she says, is “a must-see show, an amazing, major production”. Yet she is not shy about her preference for Salvador’s less formal bacchanal. While Rio’s top samba schools are converging on the Sambodromo, the Bahian celebration is more diffuse: “You don’t have to be in a particular place. Even if you have no money, you can still enjoy living the Carnaval free of charge”. Recounting her earliest Carnaval memories, she describes an excitement such as North American children experience at Hallowe’en. “We were always looking forward to being a different character every year, a gypsy or a pirate or a flower”. When Silvana got a little older, her attention turned to the wider community. Salvador’s celebration is energized by afoxés and blocos – parading organizations that fill the streets with color and sound. “You want to participate in that sort of group with people from your neighborhood”. The Filhos de Gandhy, or Sons of Gandhi, is arguably the most iconic afoxé. Famed for their blue and white regalia, they formed in 1949. More than 60 years after the end of slavery in Brazil, Bahia’s black citizens were generally banned from Carnaval processions. Inspired by the Mahatma’s non-violent fight against injustice, the Filhos set out to change that. 30 years later, European colonialism had been banished from India and most of Africa. Struggles for national liberation and civil rights helped inspire a global wave of feminism. Yet Brazil was controlled by a right-wing junta backed by the U.S. government. In the face of military dictatorship, Gliceria Vasconcelos –Silvana’s mother — helped found the Filhas de Gandhy to promote the empowerment of women during Carnaval. Afrocentric consciousness was a key part of her upbringing, but Magda was also exposed to ballet and modern dance as a student at the Teatro Castro Alves. Located in the leafy Campo Grande neighborhood, this prestigious institution is named for Antonio Federico de Castro Alves. A legendary poet and abolitionist, he is often lauded as a Brazilian Keats. Moving to the USA at the age of 21, Silvana soon formed the Viva Brazil Dance Company. The ensemble has garnered many accolades over the years, was featured on the cover of the New York Times Magazine, and performed for luminaries as diverse as Dan Quayle and the king of Morocco. The troupe always included a vocal element, but Magda insists “it never crossed my mind to be lead singer”. Yet she has recorded two albums with the Katende band. A nine-piece group, they fuse musica popular brasileira (MPB) with salsa, funk, and soca influences. Even after developing a cyst on her vocal chords, nothing has stopped this artist from tirelessly promoting the culture of her homeland. Having forged multiple media contacts, it was only natural for her to serve as General Coordinator for the annual Brazilian Day concert in New York City. Held in early September, the event commemorates the declaration of independence in 1822. Over the years, it has attracted top performers including Jorge Ben Jor, Ivete Sangalo, and Carlinhos Brown. Sponsored by some of the largest Brazilian corporations and backed by the Federative Republic’s consulate, the concert has been broadcast to Brazil on the Globo Network. Yet Silvana Magda grew frustrated. The organizers, she felt, needed to do more to involve the growing number of Brazilians living in the Tri-State area. Pondering a remedy, she recalled one of the central rites of her childhood. The Igrega de Nossa Senhor do Bonfim – The Church of Our Lord of Bonfim – is a point of pilgrimage for Salvador’s Catholics as well as adherents of Afro-Brazilian creeds. A wonder of rococo architecture, it commands a hilltop vista. Each year in January, devoted women in white clothing gather with brooms and buckets for a ceremonial lavagem, or cleansing, of the church’s steps. By contrast, West 46th Street occupies a less-than-picturesque stretch of Manhattan real estate. Yet the shops and restaurants west of 5th Avenue have earned the appellation “Little Brazil Street”. It was here, in 2008, that Silvana staged the inaugural Lavagem da Rua 46. Addressing the crowd, she expressed a hope that the procession would function as “a reminder of our values and strengthen the image of Brazil”. 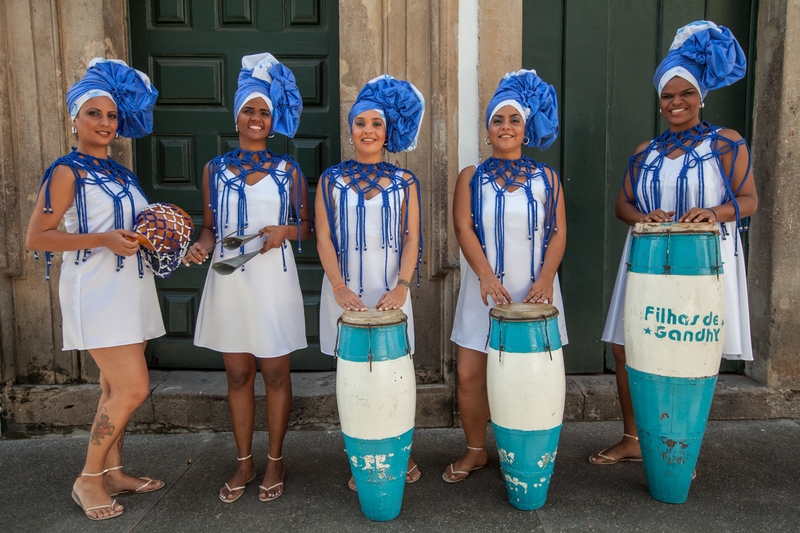 While originating with the traditions of Bahia, subsequent years have incorporated frevo and maracatu rhythms from the neighboring state of Pernambuco. The spangled bikinis of touristic clichés are noticeably absent, but Magda confidently asserts that “the spirit of Carnaval is present in the Lavagem”. The bureaucracy of permits and a dispute with sponsors meant that in 2015 the ritual relocated across the Hudson River. The Ironbound district in Newark, New Jersey has boasted a vibrant Portuguese-speaking population since the early 20th century. The influx from Portugal peaked in the 1950’s, but a lusophone vibe has been maintained by immigrants from Brazil, Cabo Verde, and other countries. The procession itself was augmented with a display of Carnaval costumes, children’s cultural workshops and a Brazilian film series at the Newark Public Library. The geography of New Jersey’s largest city provides more room than one finds in the confines of Midtown Manhattan, and this enabled a new facet for the Lavagem. Trios Electricos – massive stages on wheels – have long been a feature of Carnaval parades in Salvador. In 2017, Ms. Magda and others arranged to bring such a truck to Newark. Anticipation was high, but 36 hours of torrential rain threatened to derail the festivities. A few minutes before things were set to commence, the skies cleared and everything proceeded as planned. Where some might see mere meteorology, Silvana Magda found confirmation of a spiritual element that resides at the heart of all communal celebrations. “I know now” she says “that the orixás exist”.